Welcome to the inaugural Friday Felines blog! We share our home with four adorable cats, and five others who have gone on to Rainbow Bridge and are waiting for the others and us to join them. I love my kitties, and my life is so much richer with them in my life-even when I am rudely awoken to rolling kittens fighting to see who gets to sleep on Mama! 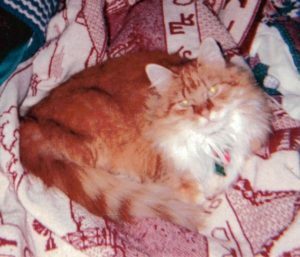 The first cat we had was a gorgeous orange girl we named McIntyre Jayne. She had been dropped off at the Bear Paw Battlefield south of Chinook. After about a week after inquiring about the cat, the ranger at the battlefield called to say he had our kitty, but she would have to be spayed. We agreed, but when they put her under, they found out she was already spayed! So, she was someone’s cat and someone had ruthlessly cast her away like she didn’t matter. She was The Queen and was quite spoiled. She didn’t like other cats much, but got used to them as time went on. However, they all knew she ruled the roost and most kept away from her except twins Skinny and Shorty. She loved McDonald’s French fries; she probably ate a bunch of them when she was trying to survive out at the battlefield. So, as a special treat, I would bring home some McDonald’s French fries and would share them with her on occasion. At the age of 17, on March 12, 2015, Mackie went to Rainbow Bridge, but she is still beloved today.